This palm is considered vulnerable in its native habitat with an estimated population of less than 1000 mature individuals in an area that is not widespread. This is a medium to small Ravenea that is relatively new to cultivation. It doesn't have a big spread or get too tall. It sort of resembles a smaller R. rivularis, but more elegant. This palm will eventually tolerate full sun, but filtered is best while young. This palm is native to the dry forests and along sandy stream sides and in ravines of the Central Southern Andringitra Mountains; an area of Madagascar that is dry but not arid. The slender trunk is small caliper up to 4 inch diameter, solitary with no crown-shaft. The leaf type is finely pinnate with graceful and durable dark green bi-color leaflets which are silvery underneath from a waxy coating which gives the species its name. There is also no armor on this palm. The crown will have about 14 to 20 slightly arching fronds. Easy maintenance is another attribute that will make this popular in cultivation. Mature plants will also tolerate short periods of regular frost. This variety of Ravenea is becoming very popular, not only because of its small size with a moderately fast growth rate, but especially because it does not have the yellowing problem that plagues its big brother R. rivularis. 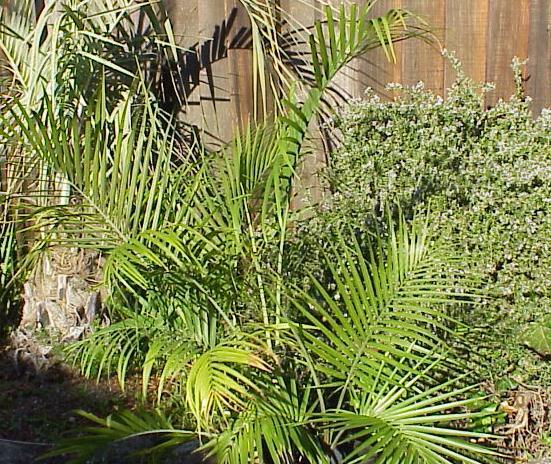 This robust palm is also more tolerant of wind, heat and drought than the fore mentioned. Soil should be rich, well drained, and regular watering will ensure best performance. Seed germinates in 2 to 3 months. For more information see October 1994 issue of Principes.